Building Type Basics for Senior Living, Second Edition is your one-stop reference for essential information you need to plan and successfully complete the design of residential care environments for seniors on time and within budget. 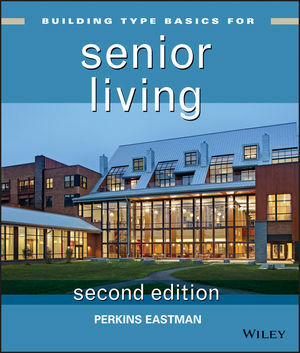 Primary authors Bradford Perkins and J. David Hoglund and their Perkins Eastman colleaguesall experts in senior living designshare firsthand knowledge to guide you through all aspects of the design of senior living communities, including independent living and assisted living apartments, and skilled nursing facilities. This edition features new examples of completed projects and is up to date with the latest developments in senior living design, including coverage of sustainable design, renovation and reinvention, international opportunities, operations, and project financing. Like every Building Type Basics book, this conveniently organized quick reference provides authoritative, up-to-date information instantly and saves professionals countless hours of research. L. BRADFORD PERKINS, FAIA, MRAIC, AICP, is the founder and Chairman of Perkins Eastman, an international architectural, interior design, and planning firm based in New York with eight additional offices in North America and four more around the world. He is author or coauthor of three books published by Wiley: International Practice for Architects; Building Type Basics for Elementary and Secondary Schools, Second Edition; and Architect's Essentials of Starting, Assessing, and Transitioning a Design Firm. J. DAVID HOGLUND, FAIA, LEED AP, is the President of Perkins Eastman and the firm's National Practice Leader for Senior Living. Over a dozen Perkins Eastman principals and senior staff contributed to this book.